Spring is in the Air! 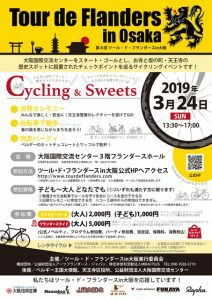 Join us for a Fun Day of Biking in the City of Osaka while sampling some Belgian as well as local Osaka sweets. ‘Tour de Flanders in Osaka’ has been carefully selecting two great courses for you. Both courses promise to be pleasant rides and will appeal to the rich history and the beauty of Osaka. We will finish with a true Belgian style closing party in the ‘Flanders Hall’ of the Osaka International House. 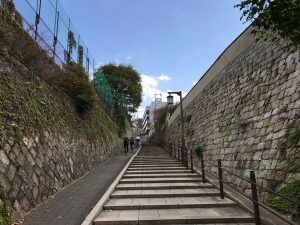 A course of about 6 km climbing the Tennoji Nanasaka (Seven Hills ) and visiting temples and shrines of the historical area of Tennoji, all the while sampling some local sweets. 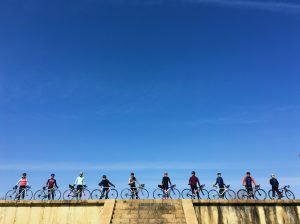 A Group Ride of about 20 km amid the historical landscape of the Tennoji area, while enjoying some steep ‘Tour de Flanders’ like slopes. A well-maintained sports bike is essential.